Every afternoon at 4:55, I hear the ghostly whooooosh of the heater in my office turning off. This sound, and the stillness that follows, alerts me that I have ten minutes, at best, before I will be able to see my breath in my basement office. The heat that has steadily gathered throughout the day frees itself in seconds through infinitesimal cracks in the single-paned windows and dissipates in the reliably below-freezing atmosphere of wintertime upstate New York. Once the heater turns off on Friday afternoon, it does not turn on again in my building until Monday morning. Some days I pile on jackets and fingerless gloves and keep working on into the frigid night. Other days, exasperated, I throw as many books as I can into a bag, grab my laptop and head to an overheated, overoccupied Starbucks or home to my own small chilly apartment where I fight for space with my son’s toys and slip on headphones to drown out the inevitable television show I will have to put on for him so I can keep working toward my tenure. a room of one’s own sometimes isn’t enough–not without heat. not without mental space to work. While a small sound, the sound of the heater’s inevitable shut down has become a metonym in my life–invested with worries over budget cuts in the public university system–I am guessing there was a time when humanities professors could work on into the night, or were at least trusted with their own climate controls. I find it odd that we intervene daily in the production of new knowledge and in the lives of our students, but are not entrusted with the on/off switch to our office heaters. The whoosh also reminds me, viscerally, that I am only a tiny cog in a large institutional machine–that cares not whether I freeze or assumes that I have other places easily accessible where I can perform my intellectual labor–an institution that uses climate control to impose 9-5 work hours on a job we all know absorbs so much more time than that. ”Do they want us to achieve tenure? Then they need to leave the heat on a little longer!” the other junior faculty basement denizens joke–kind of. and then we dissipate, leaving the warmth of each others’ company behind when the cold gets to be too much. I was out of town this weekend but I managed to make this doodle and capture it with my phone. I was at a loud concert where I was overwhelmed with the sounds coming from the speakers, and the lights and the crowd and the lack of stillness. Then I noticed how even when the world around you is flooded with noises, you can sometimes catch a syllable or a part of a word from someone’s conversation near you. Because they’re screaming, a tone from their voice, a simple tiny tone, reaches your ears. The floorboards in the corridor outside my studio are old and creaky. As I sit here I occasionally hear the door at the end of the corridor open and then – footsteps. A visitor? A delivery? For me? Or maybe just a passer-by. Fast steps, slow steps, children scampering, dogs’ claws sclattering. Occasionally, someone is lost, reading the signs on the doors, or someone stops and takes a call on their mobile, oblivious to their eavesdropper. Mostly, no one comes and no goes. But when they do, the noise connects me to the building and the wider world. By and large, I don’t register it at all, yet the tiny cycle of recognition, expectation, analysis and farewell provides an emotional ripple as I drift through my working day. Not enough time to make this video very pretty – but my week’s been interrupted by a malignant pest. You know the type. Insignificant but irritating. Thanks to Devolver for use of the song Higher Elevation from the album Christs Lane (out later this year on transsiberian music co.) And thanks to the mosquito – said no one ever. In all the rooms I inhabit in this city- the place I live, work, make art- they all have one thing in common. They are surrounded, either above or below or to the right of other rooms, other rooms that are also full of people and sounds. Sometimes I hear those sounds through the walls. At home, I might hear the sound of a TV laugh track filtered to an almost abstracted swell. In my studio, I might hear the fuzzy beating of the Pentecostal church band practicing. These noises make my space feel different. I feel the room-ness of the room, the boxiness of the building we share. It tears down the illusion I have of being alone. The relationship of one sound to another changes my experience of them, just as colors placed together change my perception of them. This piece is about the collective mass of noises I hear through walls, translated into form. The small sounds that plague my day are often the result of an object being stirred by electricity in a way that wasn’t meant to be. The buzzes and hums around me are ambient noise that most overlook… but they seem to sneak into my conscious mind. I see these sounds as frequencies and sound waves. On a quiet night in March, I put myself to bed sans earplugs. Normally I require, but do not prefer, the use of these simple noise blocking accessories, as my housemates kelp less regular hours than I do, and I value my sleep. As everyone happened to wind themselves down at a comfortable hour last Sunday night, I thought I could get away with this omission. 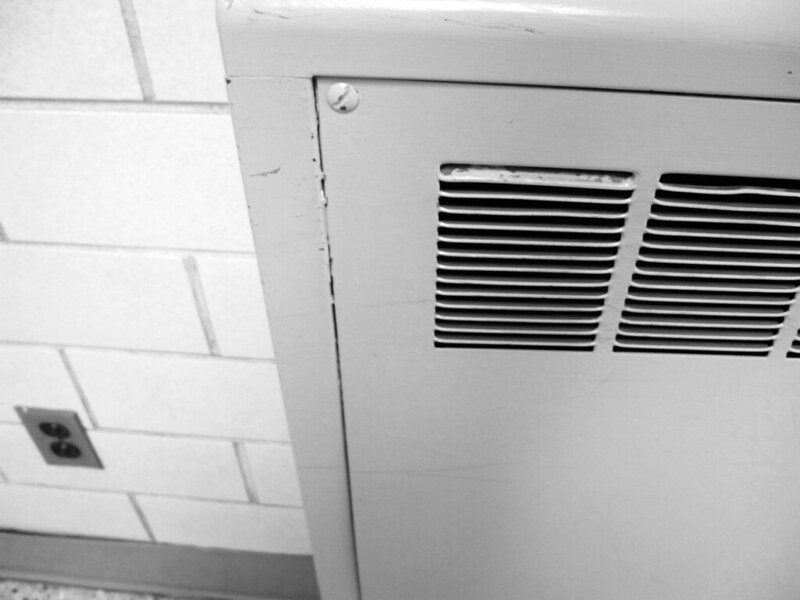 You can imagine how I felt when my radiator woke me up at 4:00 a.m.
Other Chicagoans have posted about their own heating systems and the insignificant sounds that our antiquated (vintage) buildings make during the colder months of the year. My radiators have indeed taken on a new sound significance this past week. In fact, I am angry with them. They are doing their jobs a little too well, working overtime, with gusto, in late March. Earlier in the year I named two of the radiators (“Ha-ha-harvey” and “Clementiiine!”), and this exercise in personification has made me feel as if they should be a little more considerate. Do they not understand that I have a strict bed-time schedule? Really, Ha-ha-harvey, do you need to make that sound at this hour? I am not really complaining about my fully functioning heat, which is included in my rent. I am merely expressing myself. It’s the little things that sometimes get you down. Like – when you can’t decide which way to turn. To hear small sounds is easier when you have silence around. Silence is never totally silent, except in outer space I think. I like quiet spaces myself, as it gives me more room to think. Sitting in my apartment, I hear the tic tac of an analog clock, drops of water falling in the sink, the fridge humming. Sometimes I hear sounds from cars outside, behind closed windows and winter’s soundproof curtain. And if I pay attention, I’ll even hear myself breathing. I’ll hear my breath between all the domestic objects’ breaths. Soundscapes are dynamic by definition! More than being dynamic, they are repetitive. No! They, actually, are cyclical. Never repeating themselves but yet maintaining their identity. Nevertheless, a time cycle clear changes soundscapes. Allowing us to hear “a different orchestra”. That cycle is night and day! Soundscapes repeat themselves but yet, they change very dramatically during the course of 24 hours. For this challenge I recorded my backyard during day and during night. The same thing with two different sounds, thus, enabling me to hear new elements. Night, especially, really brings out little sounds and small elements to our attention. In a way, night amplifies sounds.